It doesn’t matter how you win this game. You just win it. Perfection can wait for a contest that isn’t England v Wales. Do boring. Kick for territory and kick into space. Do the basics: a solid set-piece, a resolute defence. Play safe: win the high balls, don’t cough possession up. And so it doesn’t matter that England went an hour without scoring a point, or that they conceded five times as many penalties as their opponents. They kept a shoulder to the front door and they locked the back gate. After being burgled at this ground too many times, the security stood firm. Because this could have been another classic Welsh larceny in London, unlikely though that seemed for most of the evening, just as it was in 1999, in 2008, in 2012 and most famously of all two seasons ago in the World Cup. When Jonny May scorched onto Owen Farrell’s perfectly weighted kick in the third minute and then fed off Joe Launchbury’s equally astute off-load in the 20th, England appeared ready to accelerate out of sight. Two tries up, Wales struggling to find the rhythm of a week ago, Mike Brown and Anthony Watson winning what mattered in the air, the big ball-carriers sapping strength with run after punching run. And yet Wales stayed alive, and then came back to within a converted score, despite attack after attack being repelled by the white wall in front of them, despite looking out on their feet, the great survivors searching for another great redeemer. In that World Cup triumph it had been Lloyd Williams’s late cross-kick and scrum-half Gareth Davies’ low-down pick-up and Dan Biggar’s unerring long-range accuracy that snatched a game that had seemed gone. In 2012 it had been Scott Williams’ rip and kick and run, in 2008 Lee Byrne and Mike Phillips scything through a scattered England rearguard. In 1999 – well, commemorative Scott Gibbs tea-towels are still being sold because of what happened in 1999. It could have been Williams again, had he slid on the wet Twickenham turf rather than stalling a few metres out, had Sam Underhill’s desperate tackle not dragged his legs into touch. Maybe it should have been one of the two men inside him, had he looked to the right and found them. It could have been Gareth Anscombe, had television match official Glenn Newman not ruled out what appeared to most of the stadium to be a try when the stand-in full-back looked to have beaten Watson to a rebound off Steff Evans’ shins. “It looked like a try to me,” said a fuming Warren Gatland afterwards. “And everyone I’ve spoken to who’s seen it says it was a clear try. Yet Wales had more to blame than a previously anonymous New Zealander and his quick call from slow-motion replays. Too often they took the wrong decision at a critical time, whether it was Williams and his stalled dive or penalties kicked to touch rather than the posts. When chances came in the frantic crescendo, a knock-on blew one opening and a turnover another. They lost the aerial battle and their kicking from hand was both more predictable and far less varied. England had flaws. They missed 24 tackles, seven from the otherwise calculating Farrell. For some reason they spurned multiple chances to work a drop-goal and make the game safe far earlier than it was. But they were accurate where Wales were sometimes loose, smart on a day for cold fingers and numb brains. It was the sort of weather that no parent would send their child out into unless they had smashed something in the lounge earlier in the day. 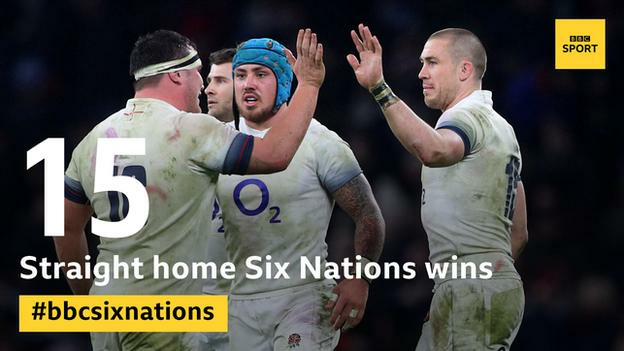 And so England kept it tight and they kept it precise: Launchbury and Chris Robshaw making 13 carries, Courtney Lawes 11 and Brown 16 – from which he made 116 metres and beat three defenders in a classic Mike Brown performance in classic Mike Brown conditions. When their two try-scoring chances came they were ruthless. The right decisions made by Farrell and Launchbury despite the occasion, and the execution to go with it. Eddie Jones was unnecessarily truculent in his post-match comments, trying to pick fights that weren’t there, accusing the media of picking his team and denigrating Brown’s abilities. Brown is a popular man with the writers and broadcasters. No-one has ever doubted what he brings in games like this, his safety under the garryowen, his aggression or his willingness to run hard into contact. Jones knows that too. His spikiness had more to do with how close this battle became, with the unwelcome brush with the same curse that struck Sir Clive Woodward in 1999, Brian Ashton in 2008 and Stuart Lancaster twice more. Wales made more metres, made more carries, beat more defenders, missed fewer tackles, yet lost. England were just good enough. And so a third championship in three remains on, and with it a continuation of the Australian’s extraordinary record: 24 games in charge, 23 wins. He is right. Worry about Grand Slams and World Cups another day. Just don’t be burgled again. Just win it.